SPLASH!! I'm diving into the blogging world, just one small drop is the present flood of missionaries who are discovering the value of blogging. My name is Cam Dunson (the Mommy in the picture) and I am a missionary sent by the Southern Baptists in the US to Porto Alegre, in the far south of Brazil. My husband, Jeff, plants churches in the greater metro area of 4.5 million and I spend most of my time and energy running a household and caring for him and our two children, Blake (age 6) and Parker (age 1 1/2). If you're not familiar with the world of missions, you may find it easiest to think of me as an ex-pat soccer mom. Who are you? (To whom will this blog be of interest)? --Our prayer partners, those folks who have committed to pray for our ministry. --Other missionary/expat wives, mostly because of the recipes I plan to share. --Other soccer moms, whatever their country of residence. --Anyone contemplating missionary service or planning an overseas move. --Anyone interested in learning more of the daily life of missionaries in general. --Recipes, recipes and more recipes. It can be quite an adventure recreating Southern US cuisine with the ingredients available in other countries. --Anecdotes and adventures. Life overseas with small children can be very, uh, interesting! --Candid thoughts about God and my relationship with Him. --Prayer requests regarding our ministry and family. --Anything that readers indicate would be interesting. Why call it "M is for Mommy"? "M" is short for "missionary" in most religious blogging circles, code used because of the "undercover" status of many of our missionaries who serve in cultures hostile to American/religious influence. 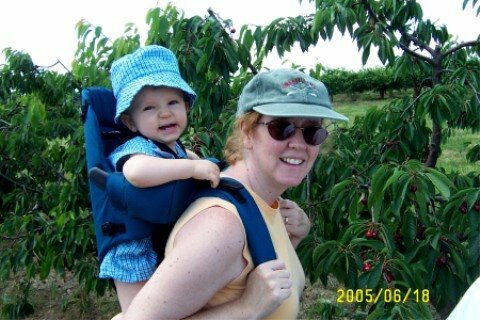 Because of the present ages of my children, most of my time is taken in the role of Mommy. Well, that's about it. Thanks for visiting. I welcome your questions and comments. It'll be sooo much easier to check on you this way rather than chasing you down by phone or computer to make certain you all have eaten a green vegetable and have on clean underwear! Hi there. Your blog is also of interest to me, your dear but lazy friend! I cannot believe how big the boys are getting! Please tell Blake that he is definitiely not a little boy anymore. He's getting such a big boy face! I also want to draw your attention to Stephen's blog, www.stephensponhour.blogspot.com. We may be a hemisphere apart, but we're close in hyperspace! Love to you and your boys. Hi Cam! Welcome to the blogosphere! It's nice to put a face to the posts I've read on the CPF. I have bookmarked your blog and will look forward to reading it. Have you any chance met my cousin Pascal Stowell? 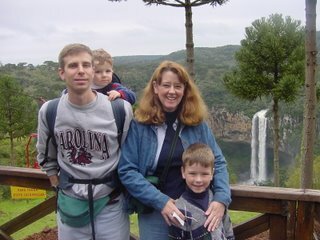 He's there in Brazil as an M (missionary, not mommy! ), but I can't remember the name of the city. He's on furlough right now, but maybe you met him before he left. His boys are about the same age as yours. I was amazed at how sophisticated our kids are! We loved Stephen's blog. Blake wanted his own, so we set one up at www.blakedunson.blogspot.com. OH my! I enjoyed your blog as well. We have met Pascal, just once--nice guy. I think he and his family are moving to Campinas after STAS. M is for mommy blog is cool.by Blake. Just ran across your blog today at Missionary-Blogs.com. We've been missionaries in Thailand for a year and a half and just found out we're expecting our first child. I've been hoping to find some other missionary "mommies" because I know that this endeavor will be an adventure! Thanks for taking the time to share!